My name is Matthew Mitchell. I am an economist and a senior research fellow at the Mercatus Center at George Mason University, where I direct the Equity Initiative. In recent years, my colleagues and I have been studying occupational licensing laws, and I am grateful for the opportunity to discuss our findings with you. Successful reform is difficult, but not impossible. Policymakers must be able to cast conspicuous votes in the general interest, while special interest power must be limited. Licensing represents a significant and growing barrier to work. Nationally, the share of the workforce that is required to have an occupational license has increased more than fourfold in the past 50 years. As of 2015, nearly one in four working Texans—24.1 percent of the state’s workforce—was required to be licensed. Aspiring entrants to a large number of professions—ranging from locksmith to animal control officer to cosmetologist—are now required by the state of Texas to obtain a government-issued license to work. It can take months and hundreds—even thousands—of dollars to obtain these licenses. Among 37 low- to moderate-income occupations licensed by Texas, the average aspiring worker is required to spend 341 days in training and pay $253 in fees before he or she may obtain a license. This does not count either the cost of the education or the income that people forgo when they spend months in often-unnecessary training. According to the Institute for Justice, Texas’s licensing laws are the 21st most burdensome in the country. Licensure is often arbitrary. As shown in table 1, licensing requirements often don’t match the risk posed to the public by certain professions. 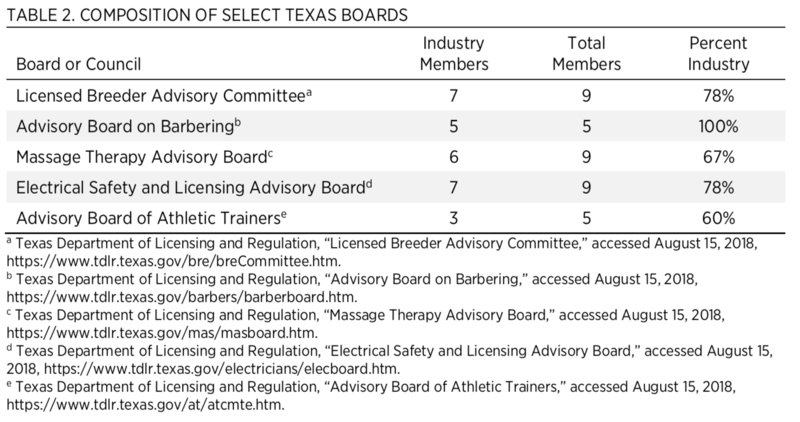 Compared with emergency medical technicians, aspiring barbers in Texas must undergo 10 times as many months of training; would-be security alarm installers (who are unlicensed in 36 states) must complete more than 20 times as much training; and athletic trainers must complete more than 40 times as much training. Licensing boards are dominated by members of the professions they oversee. About three-quarters (73 percent) of Texas occupational licensure boards are required by law to have a majority of their members work in the professions they oversee. See table 2 for board composition data in a sample of Texas boards. Owing to vacancies, many boards are composed entirely of industry insiders. This presents a legal concern in light of the US Supreme Court’s decision in North Carolina State Board of Dental Examiners v. FTC, which held that states may be liable for antitrust violations when boards are dominated by members of the professions they oversee and when elected officials fail to actively supervise these boards. It also creates a practical concern that boards will tend to act as industry cartels, controlling entry of new members rather than ensuring public safety. Licensing reduces employment opportunities, especially among certain communities. High barriers to employment pose particular difficulties to lower-skilled, lower-educated populations, to immigrants, to those with criminal records, and to those who move frequently, such as military spouses. Eighty percent of the studies Mercatus scholars reviewed found that licensure has a disparate impact on minorities. Recent research suggests that barriers to entry are associated with greater income inequality and that licensure is negatively associated with absolute income mobility. There is little evidence that licensure increases either the quality of services or the public’s safety. Theoretically, licensure might increase quality if it acts as a well-designed screening system. On the other hand, it might decrease quality by limiting competition. Reviews of the academic literature by scholars at the Mercatus Center and by officials in the Obama administration suggest that the two effects roughly cancel each other out (though more studies find that licensure reduces quality than find that it enhances quality). Licensing reform efforts are difficult to implement successfully. The consumers and the aspiring professionals who suffer from anticompetitive licensing regimes are numerous and typically politically unorganized. On the other hand, the industry insiders who benefit from these regimes are comparatively few in number and typically well organized. Economists and political scientists have long blamed this pattern of diffused costs and concentrated benefits for the persistence of inefficient and inequitable policy. And this pattern has made licensing reform an uphill battle, even though experts on the left, right, and middle tend to agree that current licensing laws are inefficient and anticompetitive. 1. An independent commission. One potential reform would be to establish an independent commission. It should be composed of experts familiar with the economic literature on licensure and with no financial stake in the current regime. It should be charged with identifying and eliminating burdensome and anticompetitive licensing laws. And, ideally, lawmakers should be bound to take its advice in full or not at all. This type of structure can ensure that state licensing regimes serve the general interests of the public and not the special interests of protected industries. More details on this approach can be found in the attached report. 2. Requiring less restrictive means of regulation. The state of Nebraska recently adopted a reform that highlights a different approach. There, the Occupational Board Reform Act of 2018 requires legislative committees to review 20 percent of licenses under their jurisdiction each year and all licenses under their jurisdiction every five years. The review process requires committees to gather information on the number of licenses the board has “issued, revoked, denied, or assessed penalties against” and the reasons for these actions. It also requires committees to review board composition, assess board activities, and compare these activities with the way other states regulate the occupation.